There are times when we should pause and think twice before accepting free gifts from a business, especially when we are starting out as a new customer. Giving ‘free’ gifts is a common business practice. Here’s an example. I subscribe to Reader’s Digest. Each year when they send the subscription renewal notice, they include a free gift. Nice! I was reminded of this post on receiving a free offer from my electricity service. They offered to send me 2 free movie tickets valued at $22 per ticket. Of course they want my consent to be on their mailing list so they can send me other offers. To cancel receiving offers one has to phone them as there is no opt out by mail or email. I don’t think it is a scam. The question I ask myself is: Do I want to be marketed to in this way. I’m tempted because I love the movies. I posted elsewhere about Free Trial Offers. Similarly, offering freebies, free gifts and samples are part of a marketing strategy to attract new business. The reason we see it often is because it works! Receiving free gifts might make us feel like valued customers or subscribers, but we should be aware of the hidden expectation of reciprocity. An example is my past experience with a hosting company that offered a free domain name with the hosting plan. It seemed like a good idea at the time and saved the cost of buying the name from another domain registrar. Two years later when I wanted to move the domain to another hosting company, I was informed that the gift of the “free domain” meant the domain name was not transferable to another hosting company. They said I could transfer my website hosting, which I did, but not the domain name. Looking back later, I think they took a chance that I would not move to a new host if I had to buy a new domain. They were wrong. I had only 4 months left before renewal of the hosting/domain registration package. That was not an ethical practice by that hosting company. Even though we know it is a marketing tactic, human nature being the way it is, we are tempted to accept such offers, often without looking at the fine print. 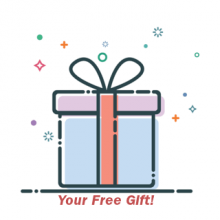 Why does the ‘free gift’ strategy work so effectively for business? Because they know how to push our buttons, how to trigger our innate instinct to repay them in some way. When a business offers us a free gift, we should remind ourselves that it is not really free. Marketers want us to feel that inner obligation that induces us to buy from them. Businesses would not do this if it did not result in returns for them. Research shows that the return value usually outweighs the freebie. Now I know why I tend to leave a bigger tip at a restaurant when they give me free mints with my bill! If you find yourself compelled to join or buy an ‘upsell’ product or service at the point that you receive a free gift from a business, I suggest that you delay reaching for your wallet. Your natural feeling of obligation will lessen over time and you won’t be as inclined to buy something that you didn’t really want or need in the first place. If you decide to accept the free gift, remind yourself it is just a marketing gimmick and enjoy it without obligation or guilt! Please post your comment to share your experiences or thoughts on freebies, free samples and free gifts from businesses. I found your article in Bing search. I am interested in the topic, so here I am. Thank you for sharing such valuable information. Yes, we must be careful. Sometimes the price ends up too high when it is “free”. An interesting read. Cool that you found my post in Bing search, Sam. It’s an older article that I recently updated. As you say, free can become more expensive in the long run than the regular price. Great post. When I still worked in the corporate sector, both giving and receiving gifts was banned. Since Roman times I am sure, there is no such thing as a free lunch! Peter, nice to see you. Yeah, it reminds me of the saying “Beware of Greeks Bearing Gifts.” We should learn from Greek mythology, unlike the Trojans who did not take Virgil’s advice. They took the huge wooden horse into Troy thinking it was a peace gift and later the Greek soldiers jumped out and took control of the city. The modern day version is the invasion of one’s wallet, lol.